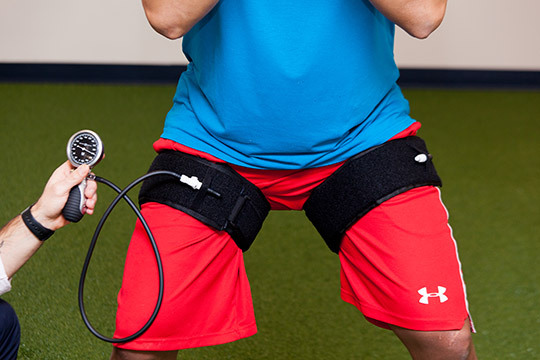 Blood flow restriction (BFR) therapy is a newer, clinical tool that serves to advance rehabilitation when appropriate. Using specialized devices (FDA approved) including cuffs, gauges, and dopplers, BFR training can enhance strength gains in both the post-operative and non-operative patient. BFR, in combination with low-load resistance training, has been proven to produce strength gains and hypertrophy (BJSM 2017, Clin J Sports Med 2017).